My headlamp lit up a halo of snowy trail ahead of me as I tramped along silently. Sylvie had dropped me off at the trail head and gone back to bed at the Hostel. It was nippy out but the nip was nothing close to what the swollen verbiage of the weather forecasters suggested. They seem to work hard at instilling a fear of winter into the hearts and minds of would-be winter outdoors enthusiasts. I was toasty warm in spite of the dire warnings of instantly frozen flesh and frostbitten digits. Before long I had to stop and remove a pair of mitts and my hat and open the front of my jacket. So much for huddling indoors by the fire! I moved along the Van Hoevenberg trail steadily and familiar landmarks came and went as I gained elevation. I put the mitts and hat back on (for every 1000 feet of elevation the temperature drops 5 degrees F) and as I approached Mount Marcy I could see clouds of snow billowing up from the ridge line. I turned a corner and found myself walking directly into the sun, which was still low on the horizon. The skies were deep blue and the wind tore through the scrubby tree tops. I arrived at the junction of the Phelps and Van Ho trails and made a left turn. The snow was powdery and 6 inches deep. I floated down a thousand feet to another junction and turned right for a stiff initial climb towards Mount Haystack. Now the snow was deep and unconsolidated and there were some low ice walls to be circumnavigated. Progress slowed to a near halt until I was past the wall and moving steadily but more slowly over a trail with no base. Before too long I caught sight of Haystack’s summit and it was obvious I would be experiencing some wind. I found a calm, sunny spot on Little Haystack and sat down and put on my crampons. The ice I had encountered was rock-hard and my microspikes skidded around uselessly on it. The crampons were a mixed blessing because now I had to take care not to catch a point on the jagged rock. There was more exposed rock than ice and because the wind was pushing me around I took great care with every step and made use of my hiking poles, leaning on them heavily for balance and stability. I had my neoprene face mask and ski goggles on and these were essential in order to face the stinging blast of ice crystals that tore into my face and eyes. Little Haystack is a small sub-summit of Haystack and you must drop 100 feet steeply over rock to a little col. I was worried the rock would be covered in thick water ice but it was my lucky day and the rock was dry. The wind did its best to play havoc with my careful foot placements but I made it down slowly and smoothly. The half mile walk up to the summit was life-affirming in the howling wind that rose and abated repeatedly, growing stronger as I neared the top. I’ve been out in much stronger winds however and felt relaxed and at ease as I used the terrain to avoid the worst of the wind. After the summit I of course had to do the entire trip in reverse and was amazed to see how quickly my tracks had been wiped clean. In one spot I had sunk in to my knees and the holes were nearly filled in with snow. The re-climb back up to the trail junction on the shoulder of Mt. Marcy went well in crampons. I would have been back-slipping horribly in snowshoes but the long teeth of the crampons bit and held perfectly all the way up. Mt. Marcy’s summit was only 20 minutes of climbing away and back into the wind of the exposed cone I went. 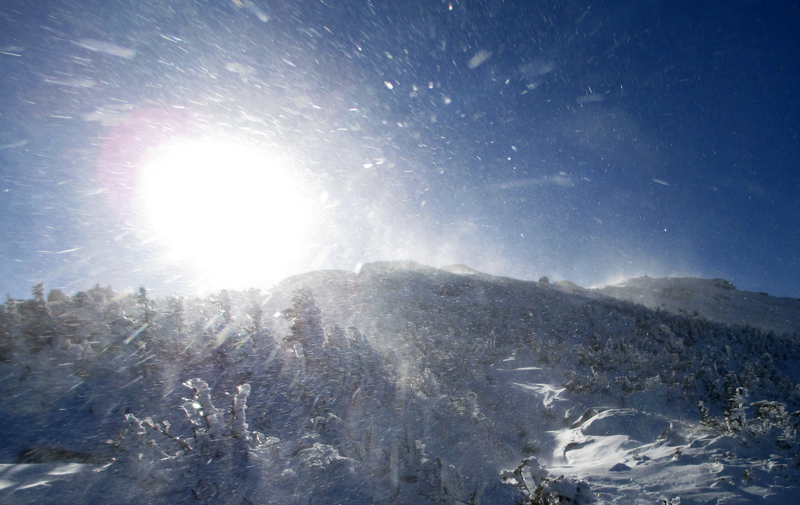 Marcy is nearly 400 feet higher than Haystack and the winds seemed a bit stronger. After quickly crossing the summit I descended the southern side in brilliant sunshine and in strong winds. No respite until treeline where I met a pair of hikers who are members of the forum. Until that point I was very much all alone with my thoughts as I absorbed the incredible display of natural forces. We chatted briefly and went our separate ways. I did a quick up and down of Mount Skylight from the junction at Four Corners and for that portion of the hike I only carried my Sea to Summit pack with my down coat in it. 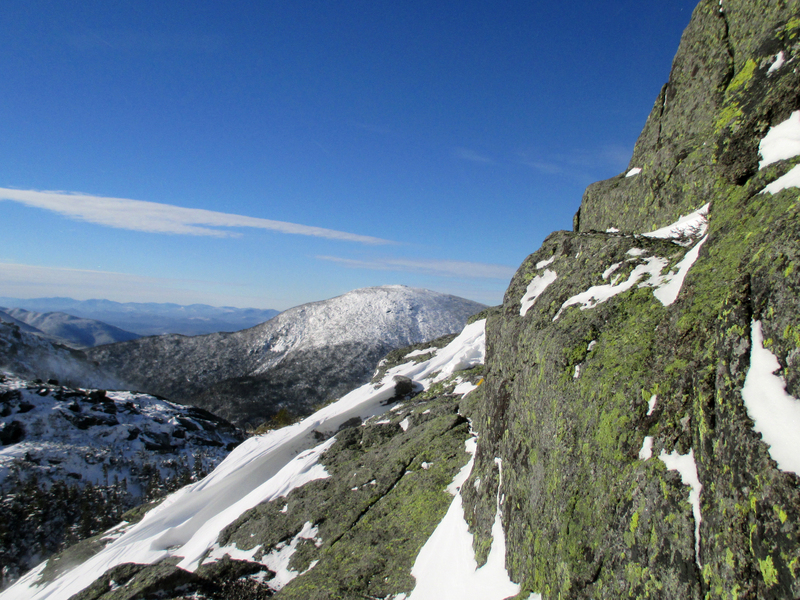 The re-climb of Marcy was a true pleasure with the sun and wind (now at my back). On the summit the wind was a lot stronger and I hung around taking pictures and marvelling at the wind’s power. On the ascent I had carefully noted the compass bearing and relationship of the trail’s direction to key landmarks such as Giant Mountian but this turned out to be unnecessary for the descent thanks to great visibility and a series of giant cairns placed at strategic points along the way to treeline. My thoughts turned to Tabletop Mountain and the sunset. If I was quick enough I would have enough light for a few pictures so I moved along steadily. 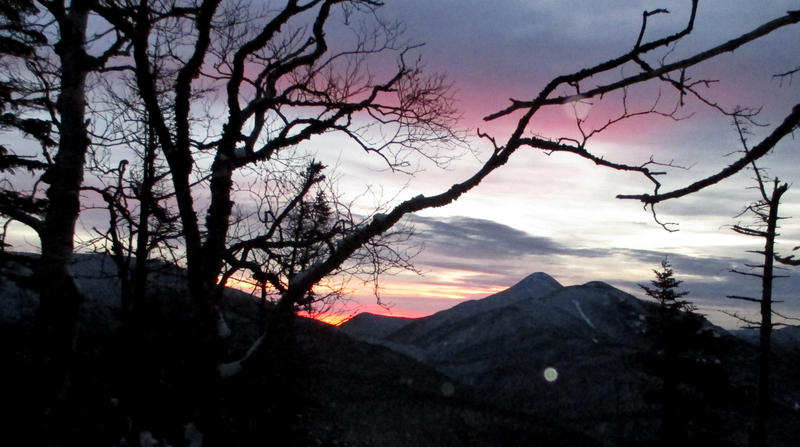 At the junction I ate and drank, switched over to a completely new set of wool mitts and fresh shell mitts, and carried my sea to summit pack with my jacket, a second headlamp and an extra set of batteries. 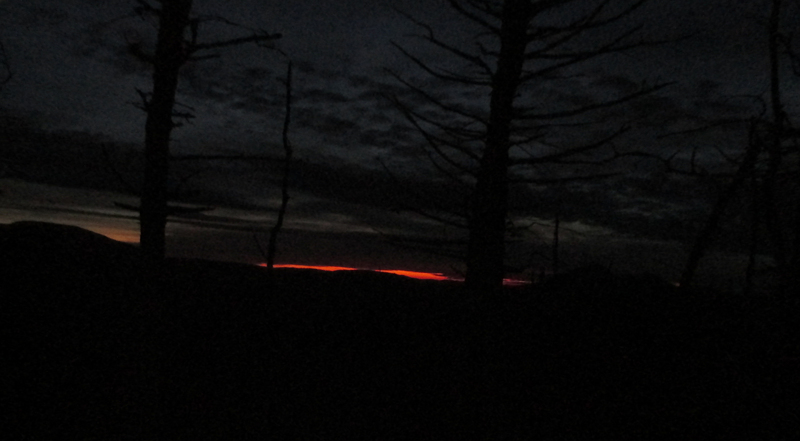 Being ten pounds lighter made a big difference and I was able to ascend the trail quickly enough for a few photos although on the summit itself there was barely any light left. I moved to the viewing area just past the summit and caught views of Haystack off in the distance and Marcy, took a few pictures anyway just in case they turned out half-decent and turned around. When I got back to the trail-head, Sylvie, who had been following me on the computer thanks to my Spot device, was already there waiting with a warm car. 10 minutes later I was at the Hostel shovelling back a hot meal. 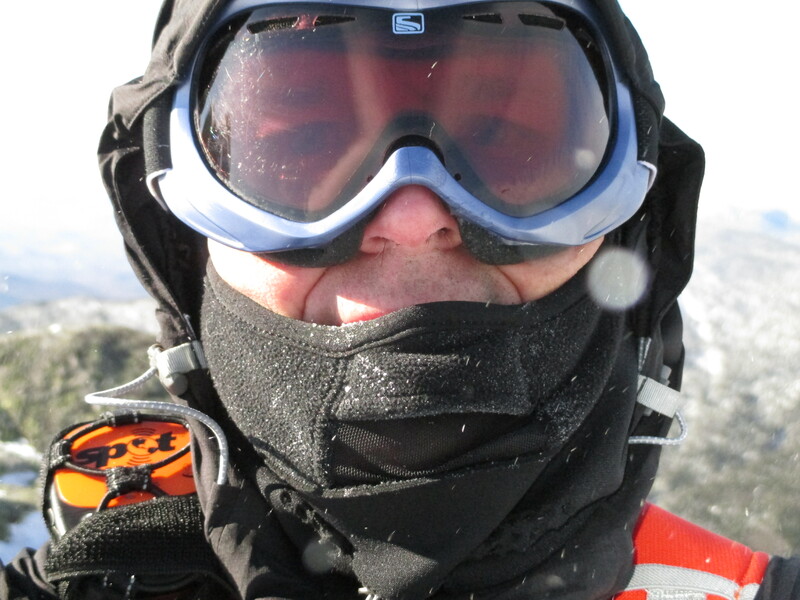 I had ascended and descended close to 8000 feet and been out non-stop in sun, snow and wind for more than 13 hours. Sleep came easily and blissfully. Great Stuff Neill. Keep up the good training work. These days it seems like I’m either gearing up for a hike, am out hiking or busy unpacking from one. 3 hours, Neil? pretty sure you were out for more than that. 🙂 13, maybe? Keep on truckin’. 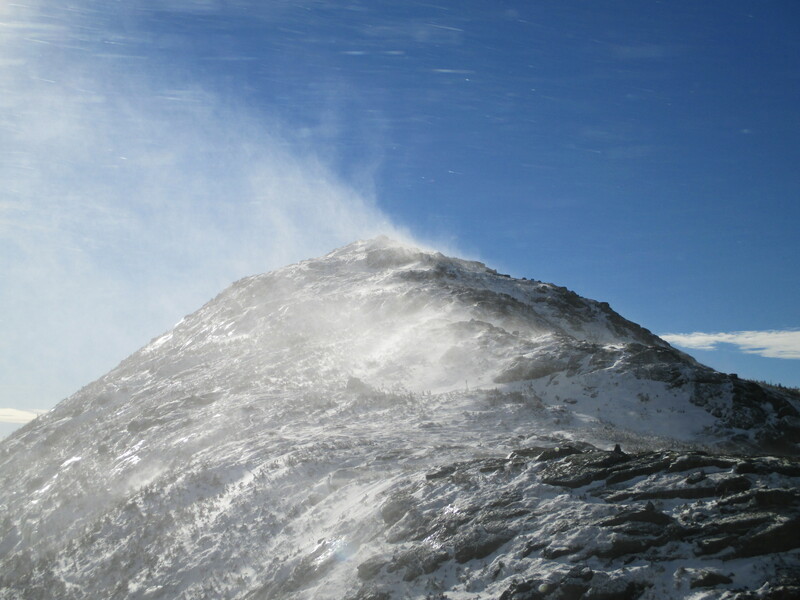 Love that shot of the wind blowing over Haystack, comparable to the ones you regularly see of Everest. Good luck with the training!. Keep it rolling! Best Regards to you and Sylvie! Awesome pics. 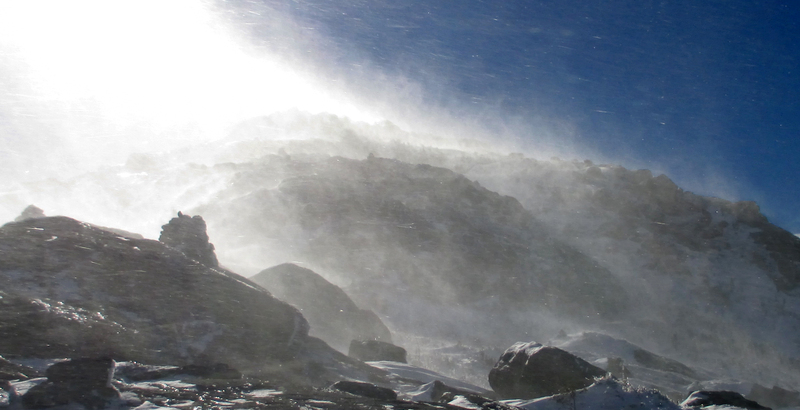 I was watching the wind whip up the spindrift from Placid. Good training day! Great pics, love the tactical report, empowering to say the least.